Creamy mac and cheese topped with perfectly tender steak tips (above) makes this something to go out for. At right, buffalo chicken wontons. Apparently, I am the last local to discover Braintree’s Southside Tavern. The restaurant is visible enough, perched on the curve of Washington Street down the street from Town Hall, large sign proclaiming the new name, which changed from J.J. Mulligans only a year ago. And while some may say that new restaurants struggle in this economy, or that it takes time for people to discover a new haunt, Southside is the exception. “We’ve been consistent from March 2012 to March 2013,” said managing partner Matt Kielty. On a recent Friday night when I visited, “consistent” was an understatement. The place was hopping with people with beers in hands in the bar side of the room, squeezed into tables elbow-to-elbow on the restaurant end. I was surprised we got a seat right away, without having any kind of reservation. Beyond the numbers of people, what shocked me was the sheer variety. 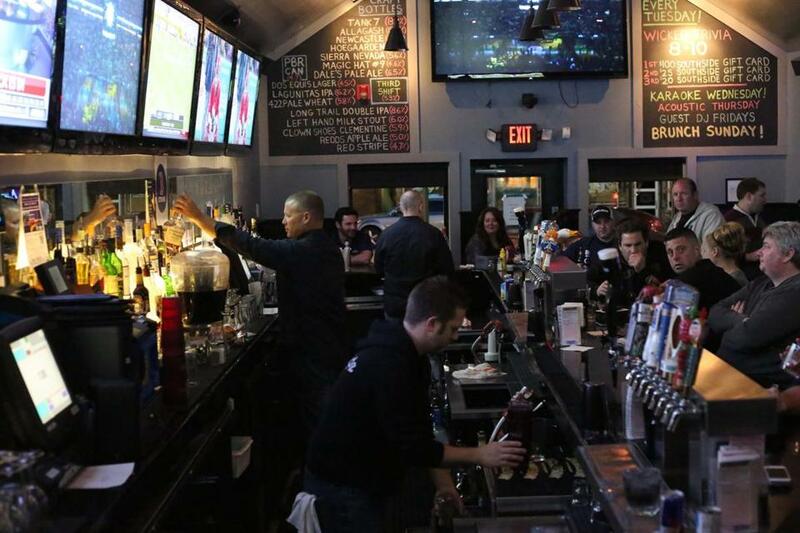 Southside is a place for everyone — families with young kids happily munched on nachos, older men in business suits enjoyed steak tips with a cold beer, young professionals waved to bartenders as they perused a lengthy and impressive beer menu. Perhaps the crowd variety is a function of the variety on the menu, which features just about everything. My picky eater, a lover of bar food, and I ordered something from almost every section. Our waitress wondered aloud how they would all fit on our small table. Despite the crowded room, service was attentive, and the food came out hot and quickly. First up were Buffalo chicken wontons ($8), which were crispy and tangy with a hint of spice. The portions were huge, and I had trouble restraining myself from devouring all of them. Their homemade taste perhaps stems from the way they are made. The steak and cheese egg rolls ($9) were equally huge, though not as impressive. Overly cheesy, the flavor overwhelmed the steak. Though perfectly crispy, the finger food was also a bit too greasy for my taste. Any misgivings I had with the steak rolls were soon forgiven when biting into the perfectly cooked, juicy California burger ($9). I’m a sucker for guacamole, and this was piled high with it, complemented with Swiss cheese and pieces of smoked bacon. The sweet potato fries were also delicious: crunchy, crispy, and sweet. The Reuben ($9) too was also flavorful, thick pieces of tender corned beef on a well-toasted rye bread. Perhaps this sandwich suffered because we had so much food to try, but after sitting for a few minutes, some of the bread also became the victim of too much grease. The BBQ Chicken Pizza ($8), however, wasn’t greasy in the slightest. Sweet barbecue sauce, coating thick pieces of fried chicken, punctured the thin-crust cheesy pizza. Of all the dishes, however, the mac and cheese ($14) with add-on steak tips was the highlight of the evening. The massive dish was cheesy, creamy, with a crispy, crumbly breading. The plate was the definition of comfort food. An atypical add, the steak tips made the dish. They were juicy and tender with a hint of seasoning that only added to the flavor of the meat. Not to be forgotten was dessert. I have to go back for the fried apple pie ($7.50). A pillow of fried dough, the dish is stuffed with warm, cinnamon-coated apples, the entire thing coated in powered sugar and vanilla ice cream. Chocolate lover? Get the warm chocolate cookie ($7.50), which featured a gooey almost cookie-dough-like dish freshly baked and served with ice cream. It’s no wonder the food sales account for 40 to 45 percent of the restaurant’s revenue, an unexpected jump from the 25 percent managers initially anticipated. “We’re very happy,” Kielty said. When I left, so was I.
Jessica Bartlett can be reached at jessica.may.bartlett@gmail.com.